What's the difference between a riveted and a welded handle? A riveted handle is connected by small metal pieces (called rivets) that are crushed between the handle and the pan body to attach them together. 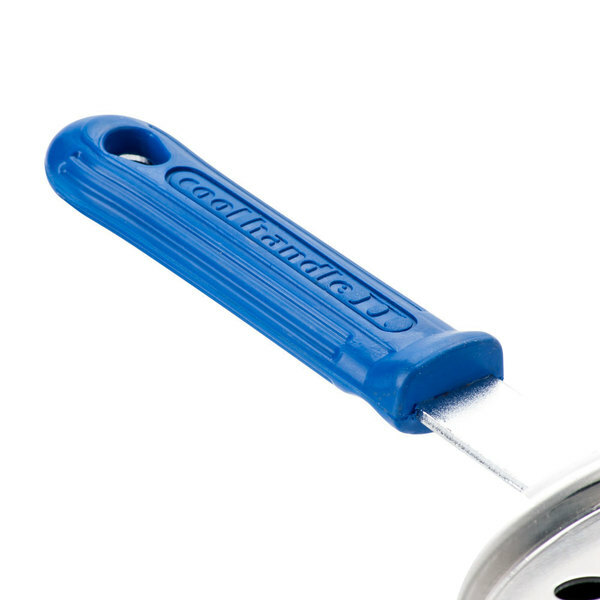 This type of handle is more common on copper and aluminum cookware. For a handle to be welded, the metal must first be melted and then adhered to the pan body. This creates a strong bond that leaves little to no space in between, so bacteria and other food crumbs can’t collect and cause sanitation issues. 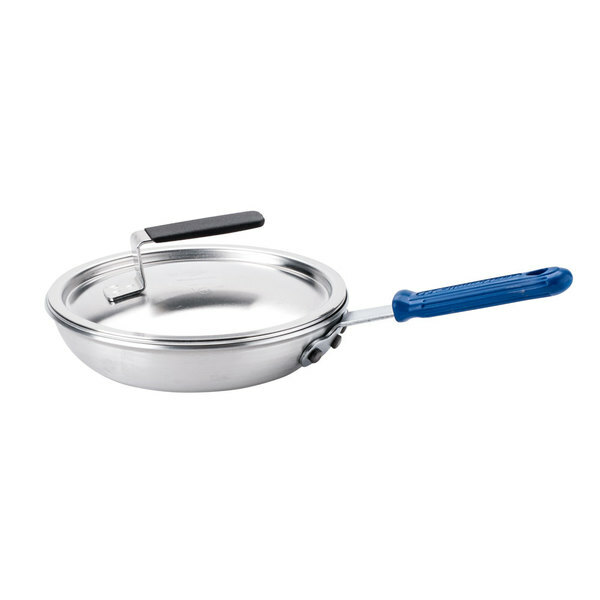 Both are long lasting solutions for fry and sauce pan handles because they are durable and can withstand heat. Ideal for medium- to high-volume establishments, this Vollrath 56507 Wear-Ever 4 cup egg poacher set is just what you need to make perfectly poached eggs at your restaurant or buffet. Made of extra dent-resistant, 3004-series aluminum alloy, the pan, cover, and poaching cups are durable enough to withstand daily use in a commercial kitchen. This aluminum material is also quick to both heat up and cool down, so you can keep your kitchen moving at a fast pace. 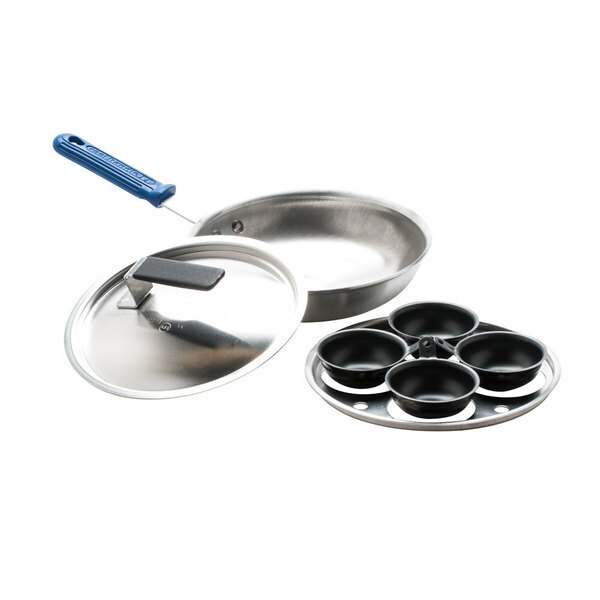 This egg poacher set's pan features an exclusive, riveted-on Cool Handle that is oven safe up to 450 degrees Fahrenheit and has excellent heat insulation for prime cooking capabilities. Its plate is constructed with small holes for proper ventilation, while the 8" pan leaves enough room for a water reservoir while cooking. 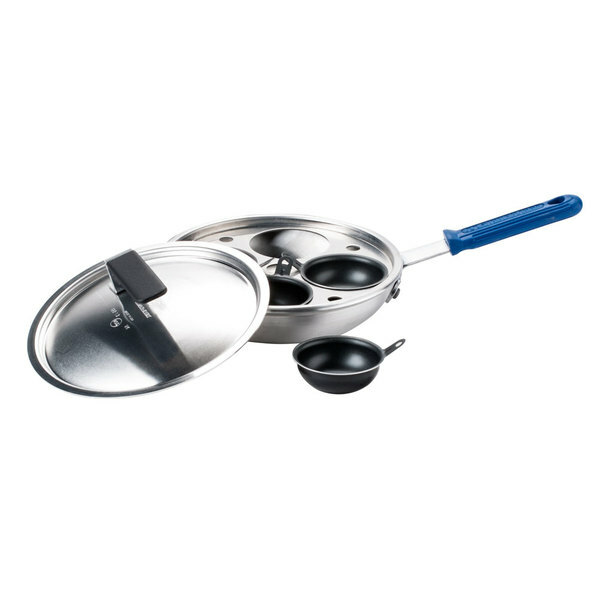 Plus, the domed cover with handle ensures your eggs poach quickly every time. Each non-stick poaching cup can make a single poached egg in just 2 to 4 minutes. These cups boast a convenient handle for easy maneuvering, along with a small hole to hang in your kitchen when not in use. 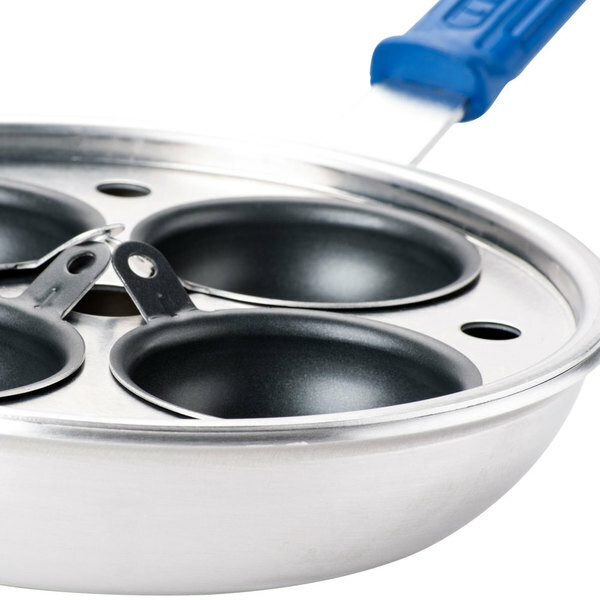 This egg poacher pan works great as long as you use a little oil in each cup so the eggs dont stick. Make poaching eggs simple and quick. This is a good egg poachers set. We use It on a daily basis and would recommend to others serving poached eggs. We would buy this again. Tis is the worst egg poacher....no matter how much non-stick spray you apply the eggs still stick. it is also very shallow so for a busy restaurant you would need to add water way too often. Thank you for you review! We are sorry you did not prefer this egg poacher. To keep this poacher in best working order, proper care is essential. We recommend avoiding the use of sprays on non-stick pans, as this will do more harm than good and leaves a residue on the interior of your pan. This causes food to stick to your pan since this residue is often hard to remove and is easily missed during cleaning. 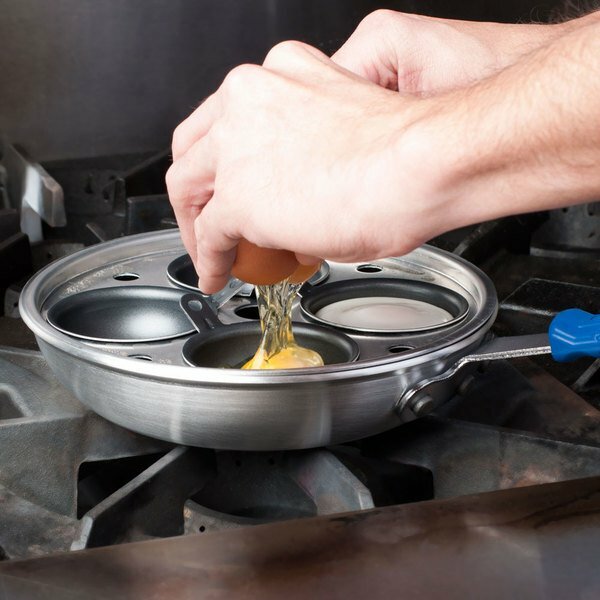 Instead of using a spray, very lightly coat the egg cups with oil to retain the non-stick qualities of the pan. This pan is great for quickly poaching eggs, no need for added vinegar, just simply add a little melted butter an egg and a few mintutes later yoy can lift out a perfectly poached egg. No need for a bulky pot of water. If you have to make poached eggs or just like them, this is the pan you need! no pots with simmering water and having to worry the eggs will be to wet. With this pot just crack the egg into the cup and between 3 and 5 min you have poached eggs the way you want them. Another great product from Vollrath! So much easier poaching eggs without any mess. The price is very good too, and Webstaurant ships fast. What more can you ask for! This is great for poaching eggs occasionally. It works nicely for an occasional order where you dont need an entire pot of water on the stove. Heats up quickly. eggs tend to stick to the poacher didnt meet my expectations at all. Thanks for your review! If you are having trouble with eggs sticking, you can coat the egg cups with a little oil or butter. Do not use a non-stick spray on non-stick pans. The extra ingredients in non-stick sprays can form sticky and discolored areas on non-stick pans. The discolored areas can lead to eggs sticking to the pan. The Lincoln by Vollrath 56507 4 Cup Aluminum Egg Poacher. It is great you can do 4 eggs at a time. Eggs ae easy to remove. These are great for places that served poached eggs but not enough to keep a pot of water going all the time. the saute pan will heat up the water very quickly! This is one excellent egg poacher. One of the things that I look in a cookware is quality, and Vollrath is known for its excellent quality products that last for a long time. 4 slots in this egg poacher makes it easy to poach a couple of eggs at a time. The special rubber hand grip reduces the heat from the handle, and makes it safe to pick up the egg poacher. If you are looking for quality egg poacher then this is it. It is great for commercial or home kitchen.